So, last week, I told you more than you probably ever wanted to know about our family trip to Harry Potter World in Orlando, Florida. Naturally, I came home with a fierce desire for all things Potter, and got right away doing some related projects. He looked pretty purturbed, actually. Like he just ate something sour and is a bit miffed by it. But I figured I could do something with him. He’s got a wire poseable frame, and is made of a foamy sort of material, so there’s no chance of changing the face sculpt at all. All I could do was try my best to give him a new paint job and brighten him up a bit. I tried turning his wonky lips into a bit more of a smile, and made his eyes quite a bit bigger. I also took off the nylon fabric they had wrapped around him, and exchanged it for some paint-stained muslin scraps I had in my craft room. And I love him! Myla likes to make him hold his arm up and say, “You must not harm Myla Hendricks! !” which is good for a giggle. I suggested we replace the Elf on the Shelf (which I got suckered into last year) with Dobby, but she didn’t think that was funny. In a geeky facebook group I’m part of, one member told us she used her Ollivander’s wand boxes as display shelves. WHAT. Mind. Blown. So, along with a snitch and a couple of other knick-knacks, my Funko Pops are housed atop ours, and they sit on our wall, making me smile a bit each time I pass them. As for the wands, my dad (being pretty crafty himself) said he’d be willing to make us a scroll display, but for now, I built a temporary one. I took an oval natural wooden plank, screwed in several cool-looking drawer pulls from the hobby shop, added some cup hooks, and a string to hold it up (the rusty star isn’t part of it–it’s a wall decoration we already had, but it fits well with everything). I bought the leather pull hoops at the bottom intending to have three, but when I got home, I realized I had only grabbed two…and then decided it was perfect for holding the map of wand spells that comes with each wand! It needs some work (never mind those holes I mislined), but I love the basic idea of how it turned out. It seems very homemade, put-together and “Weasley,” and I’m pretty happy with that. Most likely, I’ll re-do it with a nice piece of wood (and balance the wands BEFORE I drill), but for now, this works. And now he’s working on Diagon Alley!!! Look at the figure for the Weasley shop! I’m so excited to see it. He sort of went off the map for Diagon Alley, enjoying putting his own little shops in there, but it’ll have the main shops, including Weasley’s Wizard Wheezes, and a Gringott’s with a dragon on top! I can’t wait to see it! Then I got a bit obsessed by making these tiny corked mandrake seedling bottle pendants! So the monkey and I have been “off” for a few days. Every issue has been an argument, every request a struggle. This has resulted in fits and frustration, tears and tantrums. I won’t bore you with the details, and I don’t really need any advice or criticism about it–it’s a phase, I know it’ll pass, but in the meantime, it’s torturous. Of course, I’ve checked that something was not horribly horribly wrong, and by all accounts, I’m fairly certain I’ve ruled out anything major…I think it is just a matter of resisting structure, and avoiding conflict with other kids. But since life is full of conflict and structure, I have started trying to implement that into our down time. The trick, I think, is to make it fun so it doesn’t SEEM like structure. So when I told her yesterday it was “project time,” she asked if we could glue macaroni noodles to paper. Dang. I didn’t have any macaroni noodles, because no one in the whole house eats macaroni. But what I DID have was a big ol’ bag of kid-beads that a friend had given us. Sometimes, I give her a project to do and I go do something productive, like clean the kitchen, or sweep the floor. But this time, considering all the struggles we’ve been having, I thought it was important to do this project WITH her. 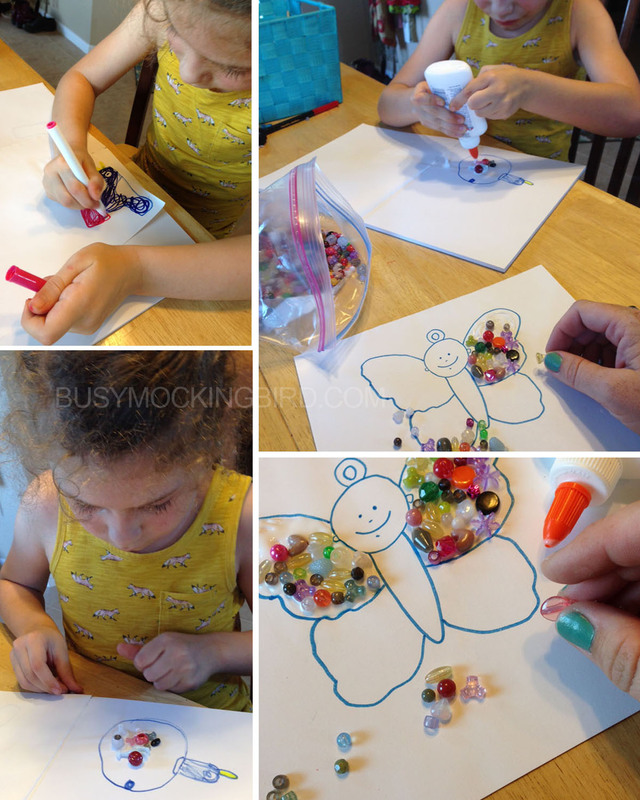 So it’s super easy: doodle something on some paper, and glue some random beads to it. Or macaroni. Or beans. Or Q-tips. Or leaves. Or cereal. Or grass. Or whatever random things you have around the house. It really doesn’t matter, because that part’s not at ALL important. The important thing is that I spend some time WITH her. Since she often goes into a project with an idea already of what she wants to do, she requested we turn them into ornaments, so each one has a little loop for a string to go through. I am the mother of a strong-willed girl. Because of our collaborations, people sometimes applaud my mom-skills…but I’ll tell you a secret every mom should freely admit without fear: I don’t really know what I’m doing. I just do what feels right, even if it’s not my favorite option. I talk it over with my husband, and we figure out something that works. And you know what I’ve learned? NO ONE KNOWS WHAT THEY’RE DOING. And the very most important thing (especially when you’re a new mom) is to keep in mind that what works for my kid won’t always work for yours. I’ve had lots of people give me parenting advice, and after it fails me, I get the feeling that they think I’ve “done it wrong.” And then I feel like I’ve done it wrong. But I’ve learned over time, that there is no “wrong.” You just try and try again, and hope that you stumble along something that works before you pull out all your hair. You can’t fault someone for trying, and you can’t give them the squinchy eye if what works for you didn’t work for them. Give them a pat on the back for their struggle, and help them come up with another idea…or at least offer them a spot on your couch, a sympathetic ear, or a playdate. Sometimes, you look around and it seems like everyone else is doing this whole parenting thing better than you. I promise you, they’re not. I know I’m not. We’re just doing the best we can over here. That smiling, happy family photo? Of course that family is posting it–they’re SO blown away that they actually have a SINGLE documented moment that looks like a magazine photo!! (I like to picture those magazine people first thing in the morning after very little sleep, with tangled hair, and bags under their eyes. And maybe a headcold, too…not to be spiteful, but because you KNOW they have to have those days). (For a bit of a giggle, by the way, I love looking at “It’s Like They Know Us” on Facebook, where they take stock photos of “perfect” families, comment on them, and hilarity ensues. PS: If you’re going on there, you’ve got to read the comments people write for each photo; they’re just as funny). Parenting is rough stuff. It’s not always that smiling happy, ethereal moment that gets captured in photos of people happily tossing their well-behaved, angelic toddler in the air as they smile adoringly at them. 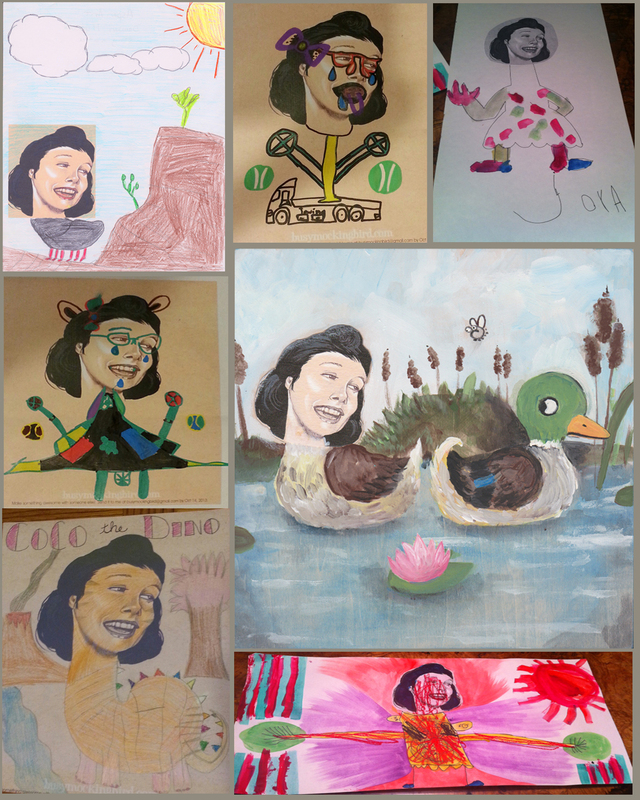 It’s not always the wonderfully monastic and artistic mom, lovingly and patiently doing art projects with her compliant and easygoing daughter. Maybe you think it’s like that for me. Maybe you think it’s like that for other people. Maybe it makes you feel like you’re not doing the best you can. If it inspires you to be a better parent, great! If it makes you feel like all your efforts are for naught because you’ll never be magazine-perfect Martha Stewart Betty Crocker parents, that’s not good. Because I can bet you it’s not like that all the time for those people. 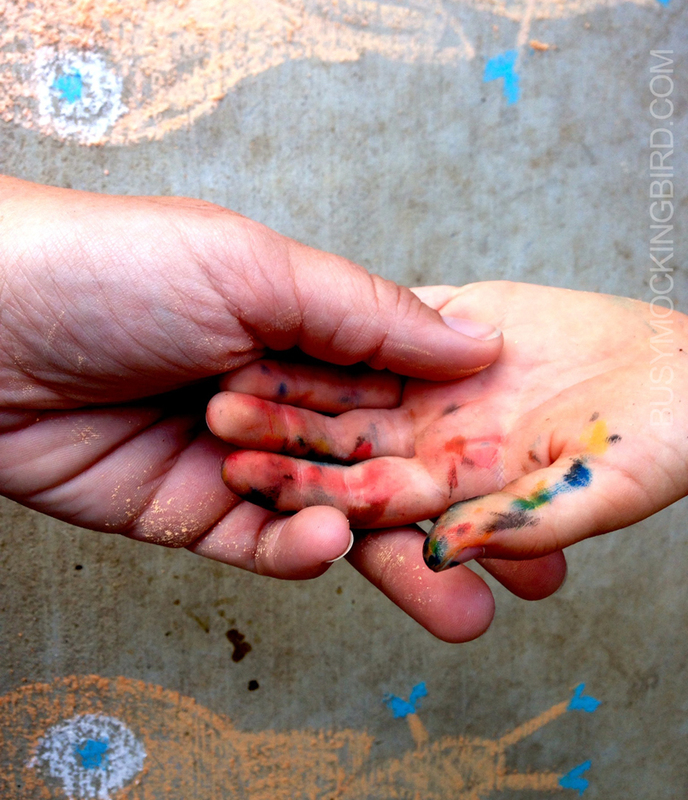 Parenting is some messy stuff, full of snot and tears and crying and frustration (and that’s just ME). 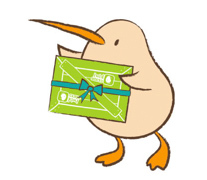 So recently, Kiwi Crate finally named their little kiwi character “Steve,” and Myla was excited. “I’d like to make a Steve doll!” she said. Since this usually involves basically ME doing all the work, I sort of brushed it off for another time. “But I think I can make it all by myself!” she said excitedly, digging through her craft box with all the giddy anticipation of a newly hatched idea. Allright, I thought. I’ll help her with the basic sewing. She’ll get a chance to see the sewing machine in action, and she can do the rest herself. 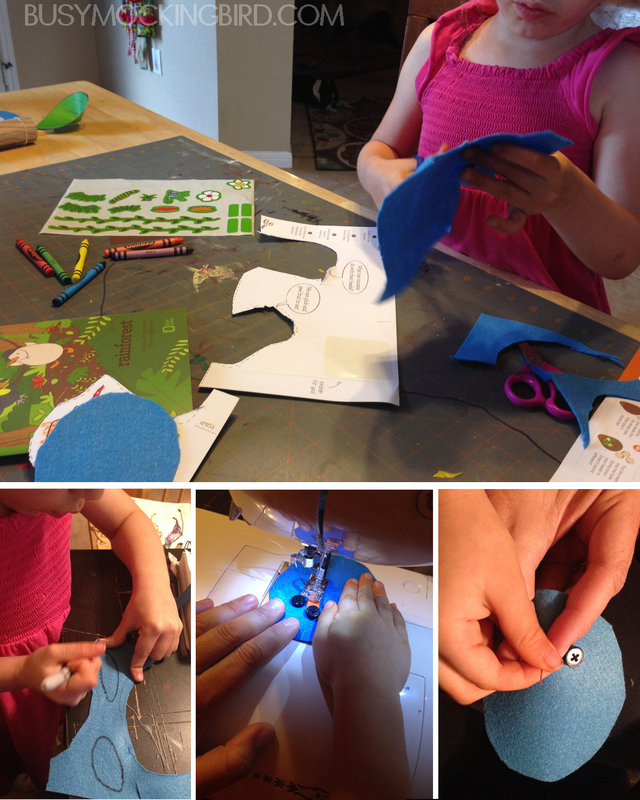 Carefully and meticulously, she cut shapes out of the felt that came with one of the monthly project kits, along with a few extra supplies from my sewing box. She quickly and furiously drew the shapes out herself, cut them out herself. It was HER vision, and she was so EXCITED. Until we put the stuffing in. It was then that I realized that in all her furious anticipation, she had a goal in mind of exactly what she wanted this little kiwi to look like, and this tiny blue thing was NOT living up to those expectations at ALL. As this reality hit her, she became instantly inconsolable. Those of you who have spent time with kids this age might be familiar with the complete and utter irrationality of a kid-tantrum. They’re these things that are unexpected, unexplainable, and completely bewildering. There’s no use saying, “But you cut it out! You must have KNOWN how big it was?! ?” There’s no use saying, “How would it possibly get BIGGER?!? !” These things mean nothing to a small child. All they know is that Thing A was in their head, and Thing B does NOT match up. And OOOOhhhhhhh the tears. Oh the crying. Oh, the dramatic frustration. It was safe to say that we were done with the kiwi for the day. Later, when the tears had finally stopped flowing, we had a chance to talk. “You were upset because you thought when you stuffed it, it would get bigger?” “Yes,” she said. “Do you understand that freaking out about it doesn’t change anything?” “Yes,” she said. “Can we do something about it? Can we make a bigger one?” she asked me, hurriedly. But to avoid the bandaid trapping of instant gratification, I insisted we would need to wait. From now on, if we were going to do this, we would take our time. We would draw out a design, pick the fabrics, take a couple of days, and make a PLAN. And now, this is our new word for projects: PLAN. Several days later, after many talks about calming down and using our words, we drew pictures, we picked out fabrics, and we started working on another Steve. We drew pictures. We picked out button eyes. We talked about his beak and his wings. We chose which fabrics to use from my fabric stash. 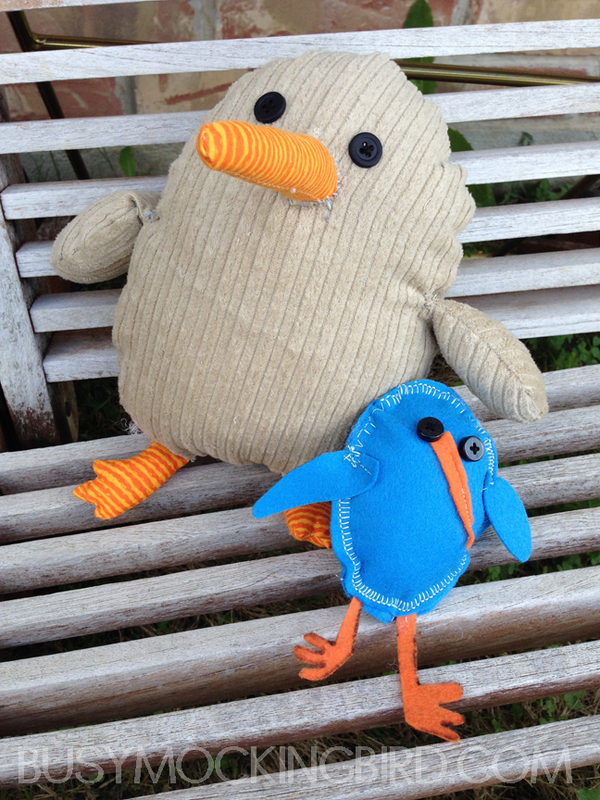 She helped me sew him. She helped me stuff him. She drew out what kind of legs she imagined he’d have. We took our time with him and planned him out. And when we were done, Steve came out looking pretty darn good. It’s a hard lesson, when your imagination doesn’t match up with your reality. It’s amazing to keep your imagination in the stars, but you also have to be aware of what’s actually within your reach, and when you’re totally and completely off-track. Another thing that’s so hard for a kid to grasp is that if you take your time and plan something out, it makes for a MUCH better project with a much better plan. These days, when everything is available at the touch of a button, it’s easy to forget that there’s also legitimate value in WAITING. Every night when we read a chapter or two, she asks me, “Will we go ahead and just finish it tonight?” And every night I tell her that we just have to wait to see what happens. Of course, she’s impatient, but she accepts it with excitement. I thought her attention would dwindle, but so far she seems to be hanging on. Later, we set the kiwis side by side, and I asked her to look at them with me. “They’re both beautiful,” I said. We talked about how when you have a great idea, it’s great to want to get it out as quickly as possible, but that sometimes when you take your time and plan it out, you have a chance to make it better, make it stronger, make it more like what you had in mind, maybe do things you hadn’t thought of before, or do them in different ways. When you rush, you might get the idea out quickly, but planning it out helps you figure things out that you might not have done with the rushed version. 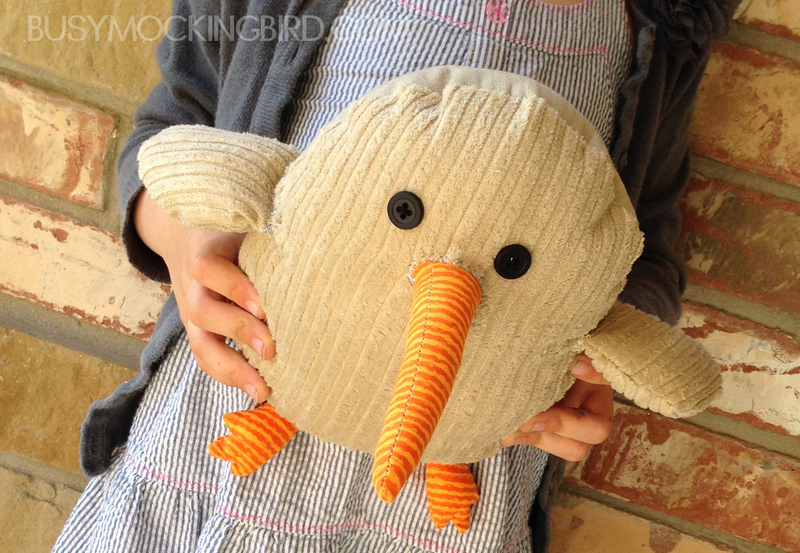 Since we took time to plan out the second kiwi, we made its wings flap down, so they could lay down to his side (instead of stick out to the sides) and we were able to make his beak stick straight out, like a kiwi’s. It’s got to be hard for kids, growing up in our new world of on-demand tv, DVR, instant downloading, live streaming, wifi, and online shopping to understand the process of having to wait for ANYTHING. I have to remind myself that that waiting is something that kids today are much less familiar with. It’s not a skill they have ever really had to use. It’s not better or worse than when I was a kid, it’s just different. There’s no use pining for the past. It’s how we live now, and there’s no use trying to completely change the world and live in a cabin somewhere…. 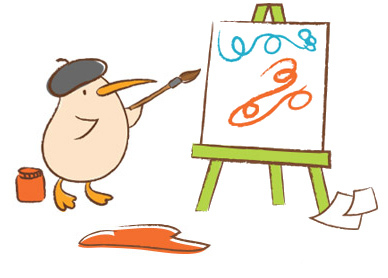 We have Amazon TV, and they just released a series called “Creative Galaxy,” about art and creativity for kids. I’d love to say that they gave us money to blog about them, or at least a stuffed animal or a visit from a character or something, but they didn’t, so this is all our own experience. So Creative Galaxy is about a little alien named Arty (of course), and his sidekick Epiphany (which, I told Myla, means “a good idea”), and they go around the galaxy “solving problems with art.” Okay, it’s just as perky as any typical kid’s show, but the cool thing about Creative Galaxy is that they introduce the style of certain artists (sort of like I’ve done with Myla with our own projects in the past), and explain what the artist was trying to do with their art. They talk about Pollock and his “action painting.” And they have lots of clips of real kids showing how to do simple fun crafty projects. The only down side to this show in OUR house is that it gives Myla a million crafty ideas that she wants to try ALL RIGHT NOW! But that’s okay. We pick and choose, and then we get crafty. 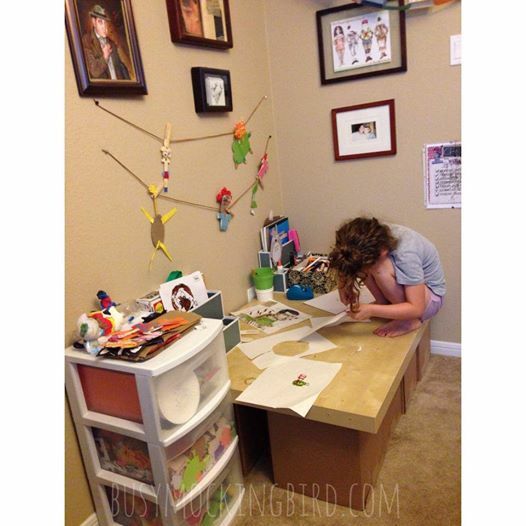 Recently, I expanded Myla’s craft area, since it had started completely taking over both the living room and kitchen tables. We used things we already had around the house, and now it’s easily accessible to her, and right next to my office area (since I work from home on my computer). She loves that there is enough space to sit on top (she REALLY gets into her artwork!) so we don’t even need space for a chair. There are office organizers for her pens and paper, as well as the bins next to it for other craft supplies like paper plates, foam, stickers, and paper bags. Perfect for all sorts of craft time! There’s nothing more that Myla likes than a stuffed animal. I think she may actually be addicted. I may have to look for some sort of help center for wayward stuffed animal addicts, actually. 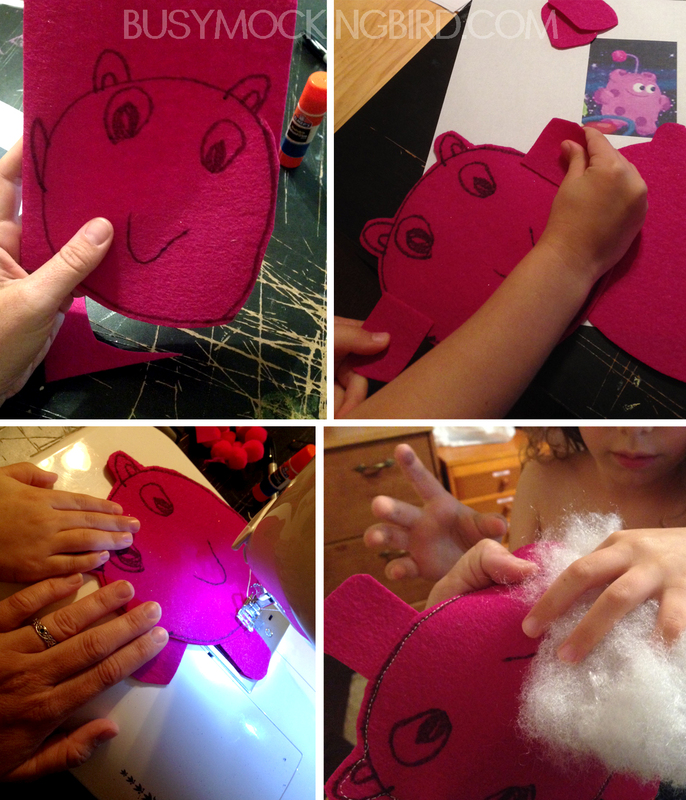 So inspired by the show, Myla decided one day that she wanted to make her own “Epiphany” doll. Epiphany is Arty the alien’s little sidekick. We’re not sure what he…or she…really is, exactly, but Myla thinks he’s cute. 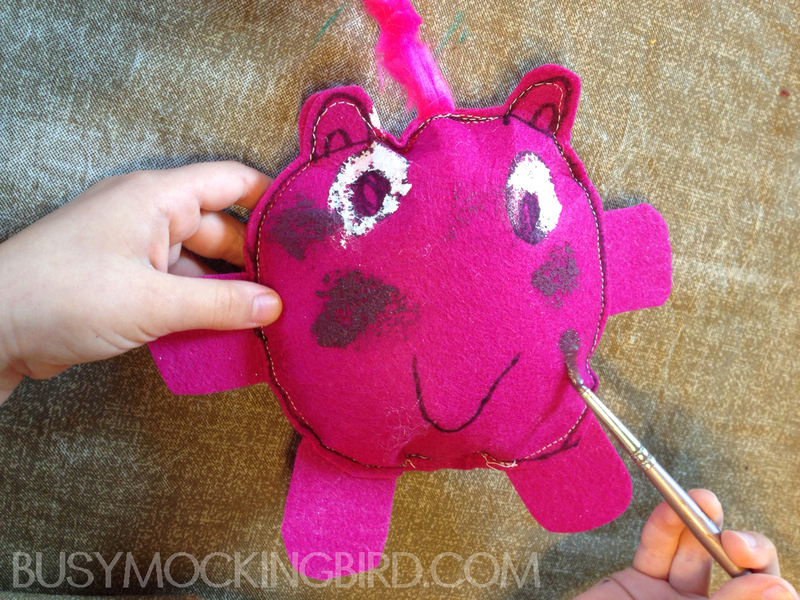 She started by drawing the shape onto a piece of felt. Since she wanted it to be stuffed, I showed her that she had to have a front and a back piece. Then she cut little arms & legs out. I had her help me sew a simple stitch around it on the sewing machine (I often have her put her hand on it to help guide it), and then came her favorite part: the stuffing! She wanted him to look a little more like the photo, so we got the paints out to color the eyes and spots. And there he is, the final little Epiphany character! 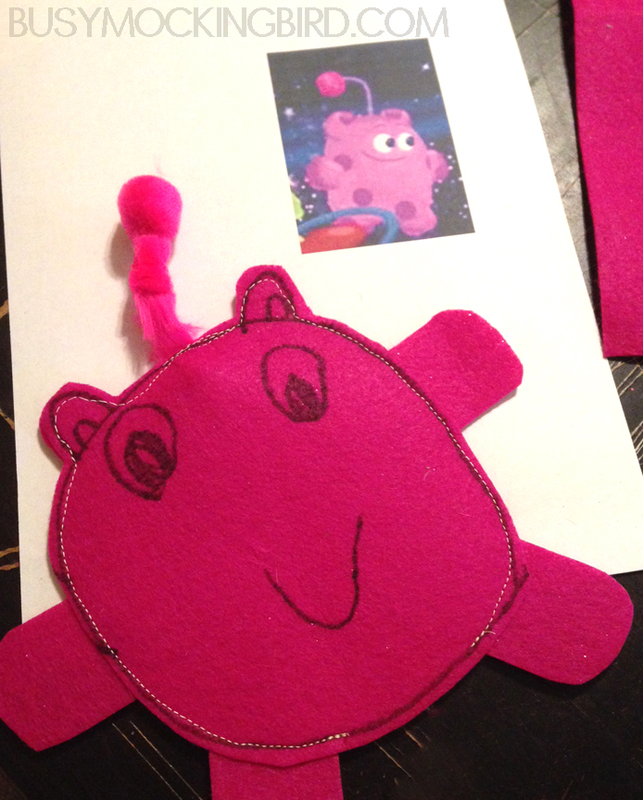 Created (almost) entirely by a 5-year old! Sure he’s a little wonky and imperfect. But the fact that she made him (almost) all by herself is something she’s VERY proud of. There are some times that the final piece doesn’t look like how she imagined and a wailing pitiful freakout ensues (we’re working on that), but I think it’s good for her to see the outcome of her decisions, whatever they may be. Simple decisions, when she can make them, make her feel more involved, like she had some sort of say in what we’ve created, and makes her more emotionally invested in it. Sure, I could’ve made her a doll, but would she learn how it was made? No. She’d just get the benefit without the effort. I don’t always indulge her in dollmaking–actually I often steer clear of it, or we’d end up making a dozen dolls a day. 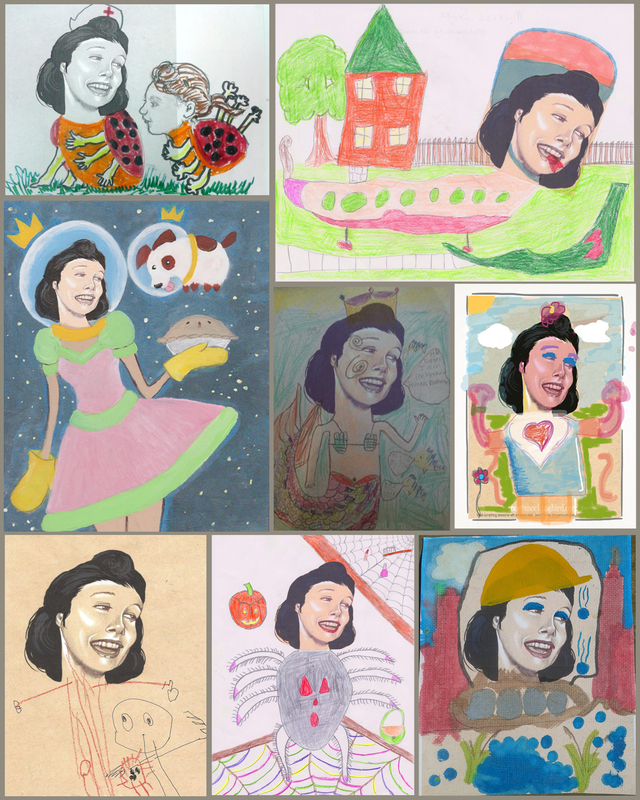 But on occasion, and with some boundaries, it’s fun to see where her creativity takes her! Quick! I Need a Crafty Gift! It happens. I understand. Things get hectic, and you inevitably forget someone on your gift list. And the teachers! What about the teachers?!? 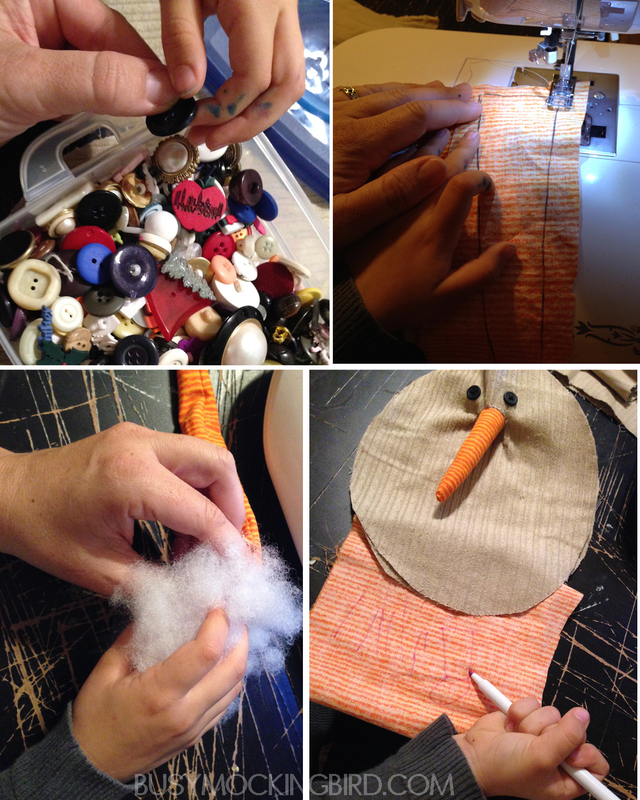 Well, I have a habit of making many of my gifts myself (when time permits), and have learned a few pointers that will help you give them a personal touch, even if time is running out. 1. Something Wooden. In any craft store or section, there’s usually a decent selection of random wooden things. 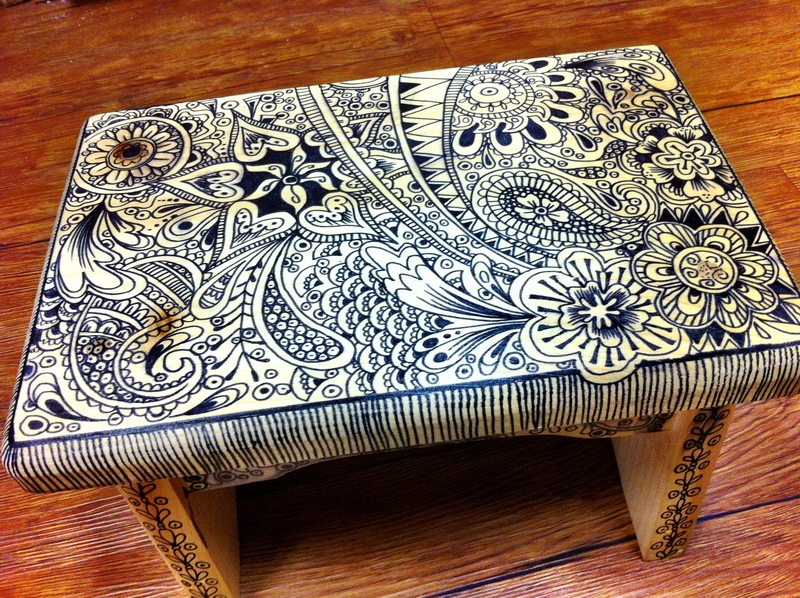 Grab a sharpie, get to doodling, then spray it with gloss varnish to set it. If you’ve got a little more time, you can paint it in a little more detail with acrylics, or decoupage some little graphics onto it. Doodle some final touches with a permanent marker or paint pens, and you’re good to go! 2. 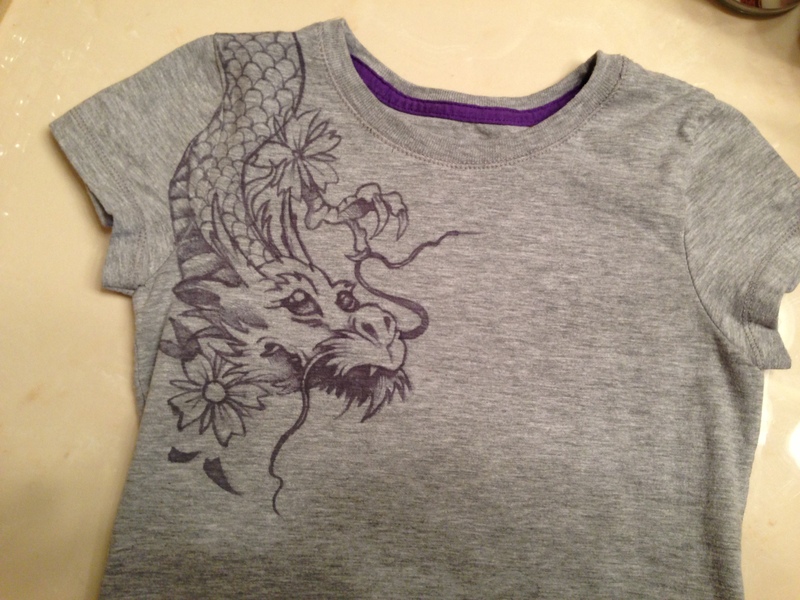 Personalize Some Clothing. 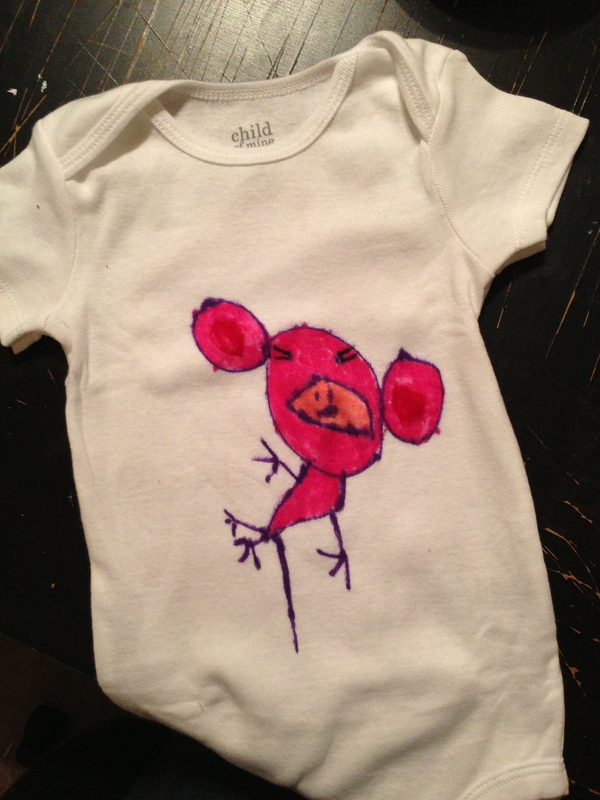 Inexpensive shirt + permanent marker and a little heat-setting=cute little something for someone. 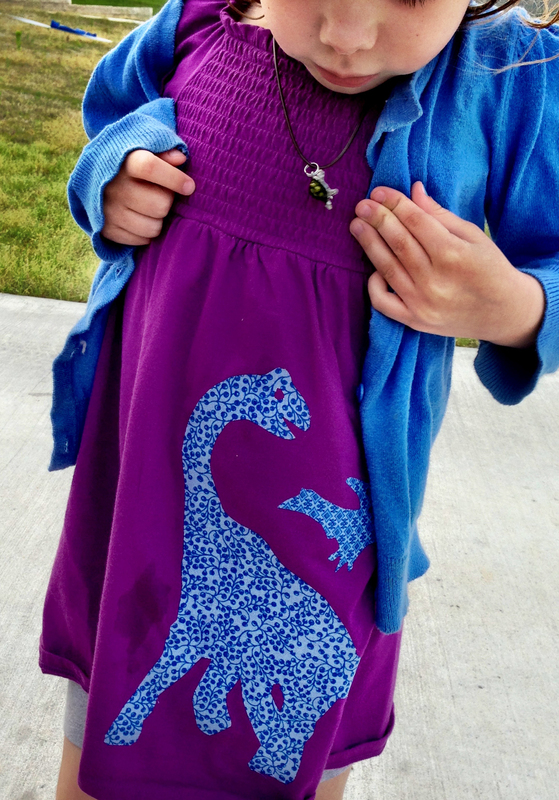 You could also personalize it with some iron-on transfers or shapes you made yourself…(I did a blog post about it ages ago). 3. 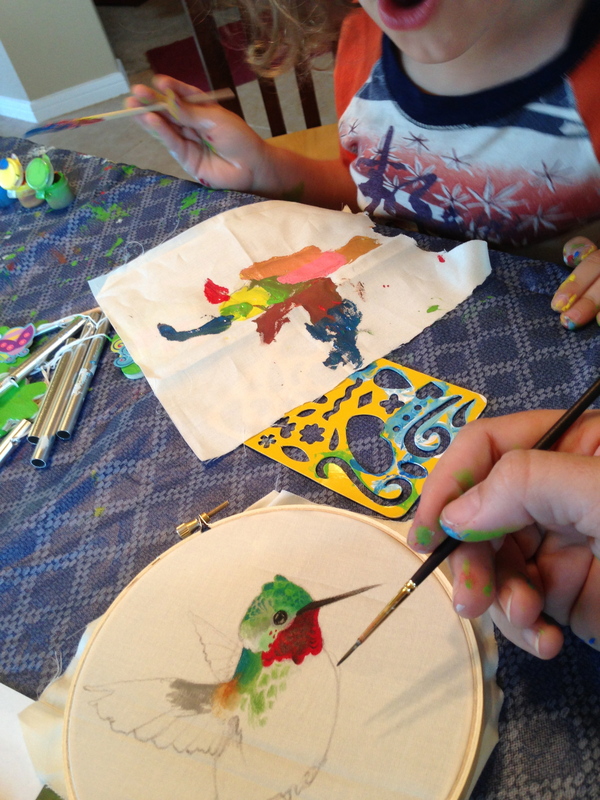 Embroidery Hoop T-shirt Art. SUPER easy. 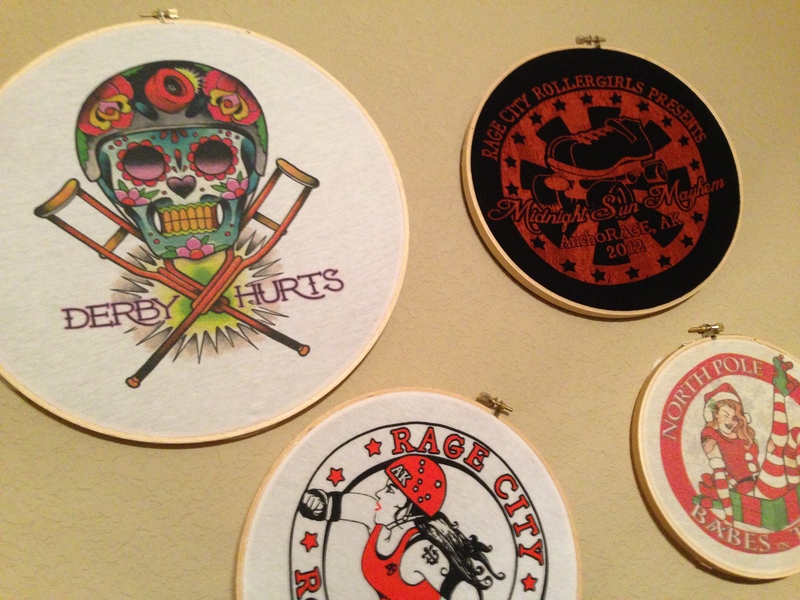 Take some favorite old “retired” t-shirts, cut ’em up, and stretch them across some embroidery hoops to hang on the wall. Voila! Fancy wall art! 4. Cup Cozy. 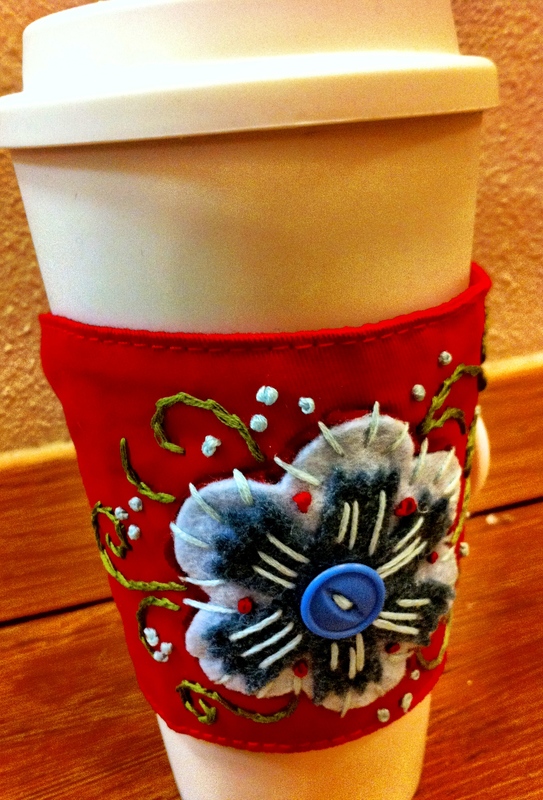 With some iron-on appliques or your own brand of embroidery work, a quick little cup cozy is a nice touch around the office (at least, I hope my manager thinks so). They even have pre-made base parts in some crafty places. 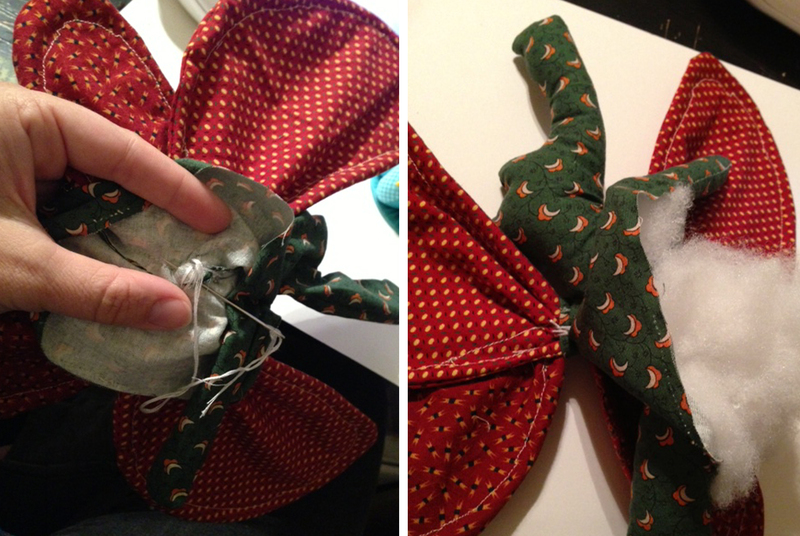 Wrap it around a reuseable coffee cup with a button hook or velcro, and toss in a gift card, or a few packets of tea. 5. 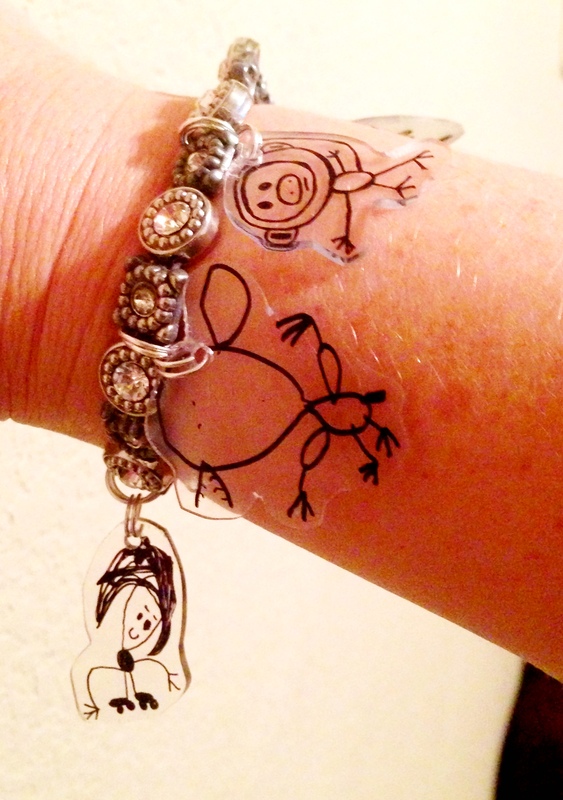 Shrinky Jewelry. A good gift for a loved one. 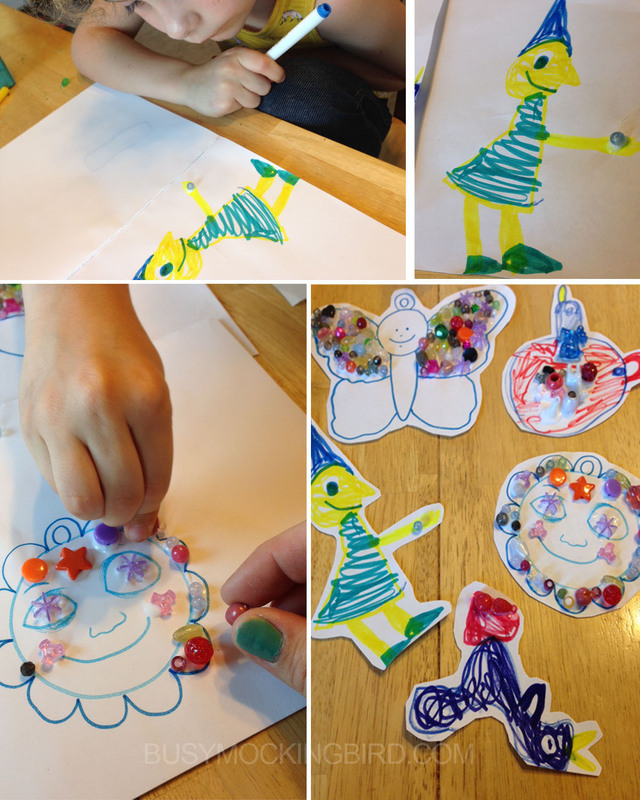 We love shrinky art. But what do you do with all those wonderful little doodles? 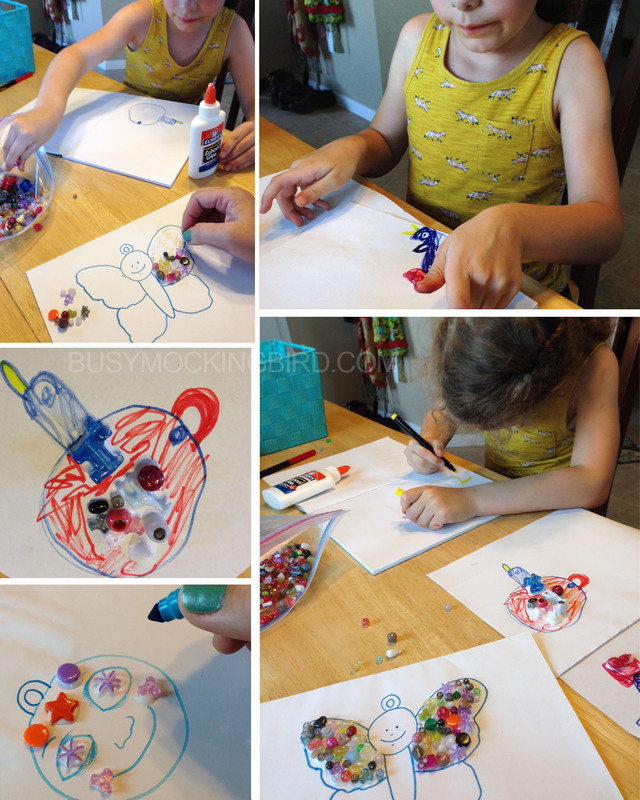 You can make these doodle chimes. 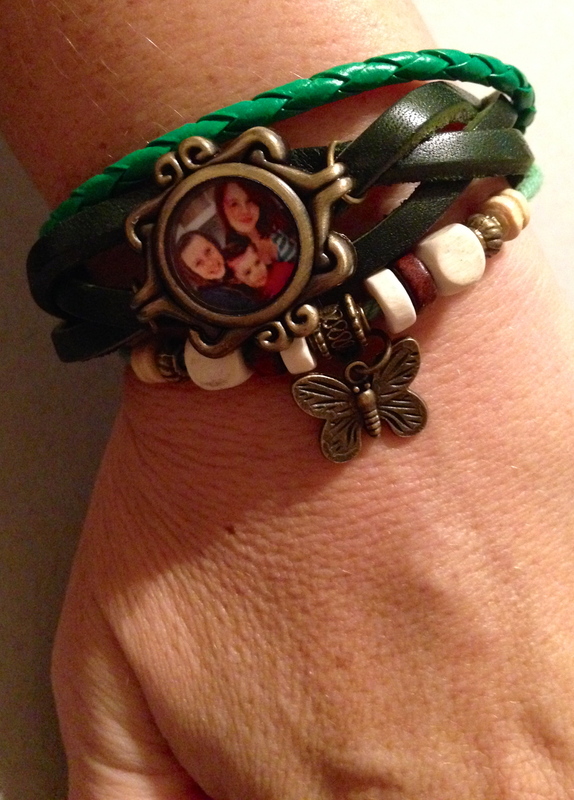 Or drill some tiny holes in them and hook them up to a ready-made charm bracelet. 6. A Quick Little Doll. I’m not sure, but most kids like dolls, don’t they? Mine does. 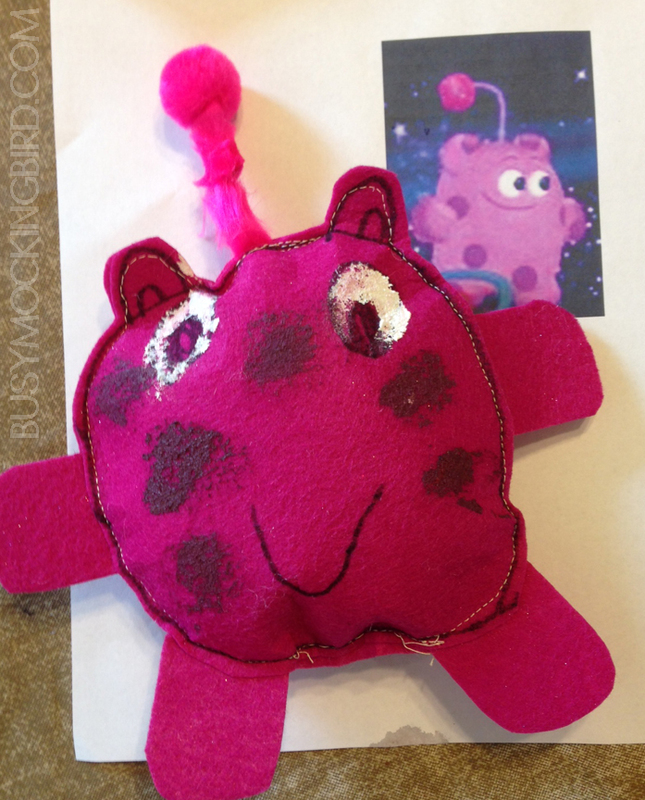 If you’re skilled with the sewing of things, a quick little doll can be made with a little bit of fabric and some easy shapes. 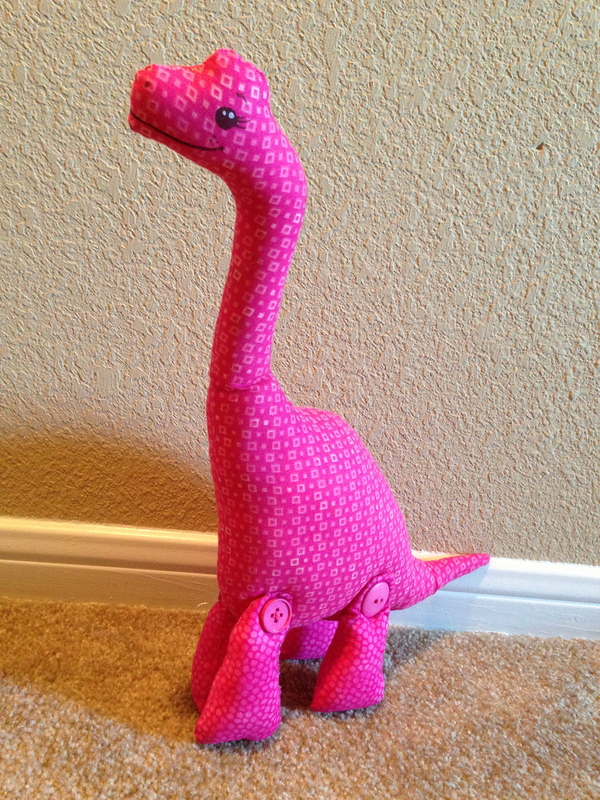 I made this little brachiosaurus in just a couple of hours. 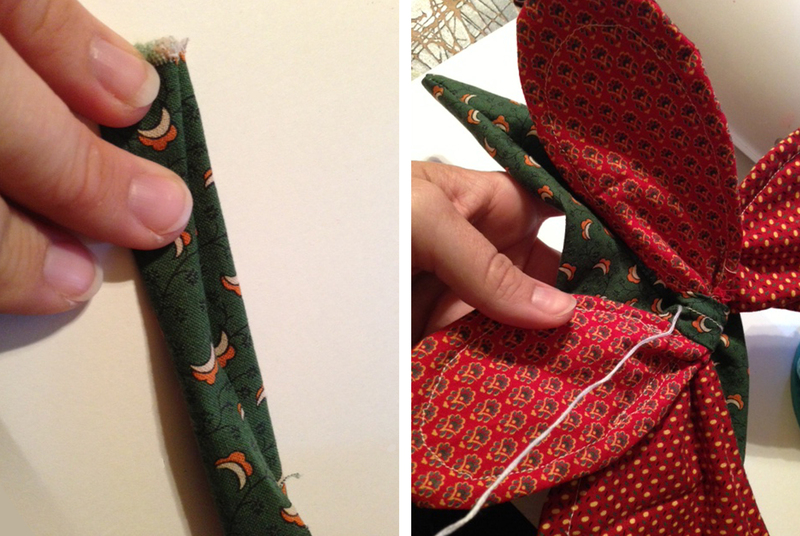 I probably wouldn’t turn to me if I needed help with the basics of sewing, but if you can handle your own, this is a quick & easy gift to make that kids should like. 7. 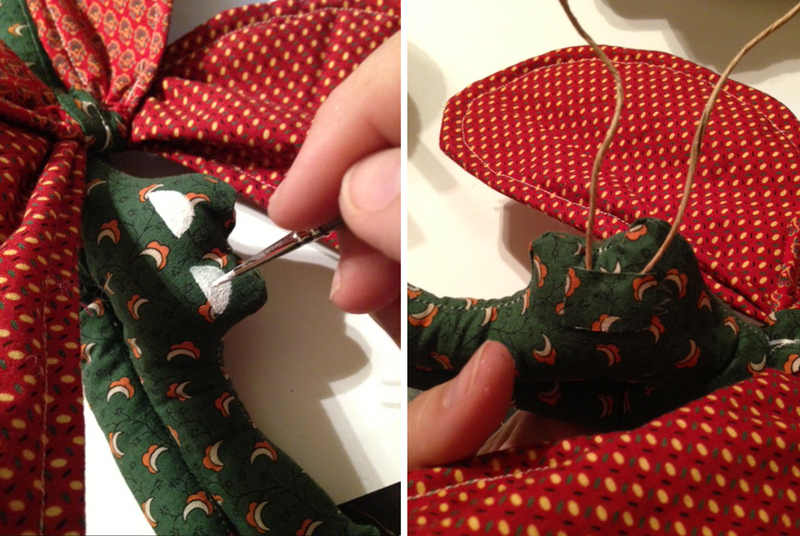 Drill a Hole in a Dinosaur. Okay, I found this on Pinterest somewhere. 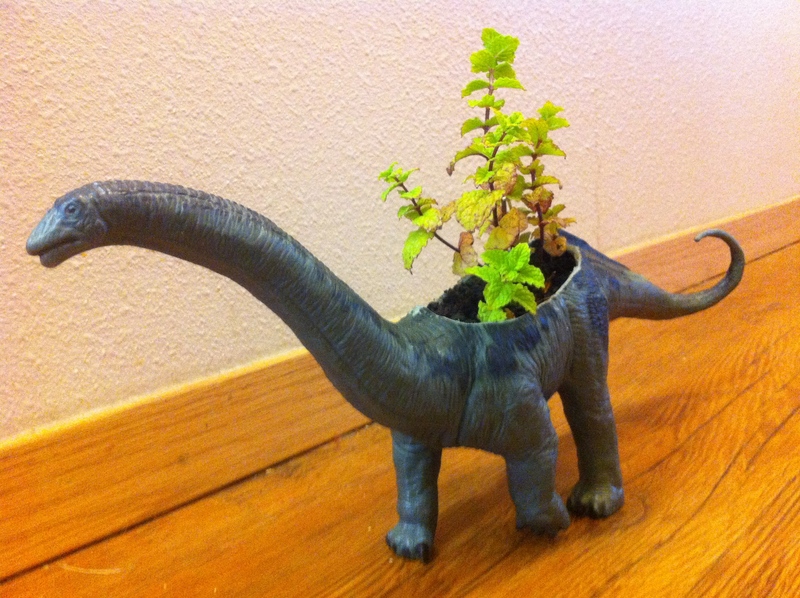 I got an inexpensive little plastic dinosaur toy & used my Dremel tool to cut his back out, filled him with dirt and put a little mint plant inside. Easy peasy! 8. Turn a Watch into a Locket. Got a little more time? Find a used watch or order a cute crafty-looking one. Take the back apart (just go with it–I had to experiment myself) and replace all the guts with a cute little photo of your intended person’s family, pet, or special something-or-other. 9. Something Edible. If baking’s your thing, you could make all kinds of fantastic, wonderful, edible things. I’m not so good at that sort of thing, but I know an edible thing is nearly always appreciated (as long as you’re aware of someone’s possible allergies or food restrictions). 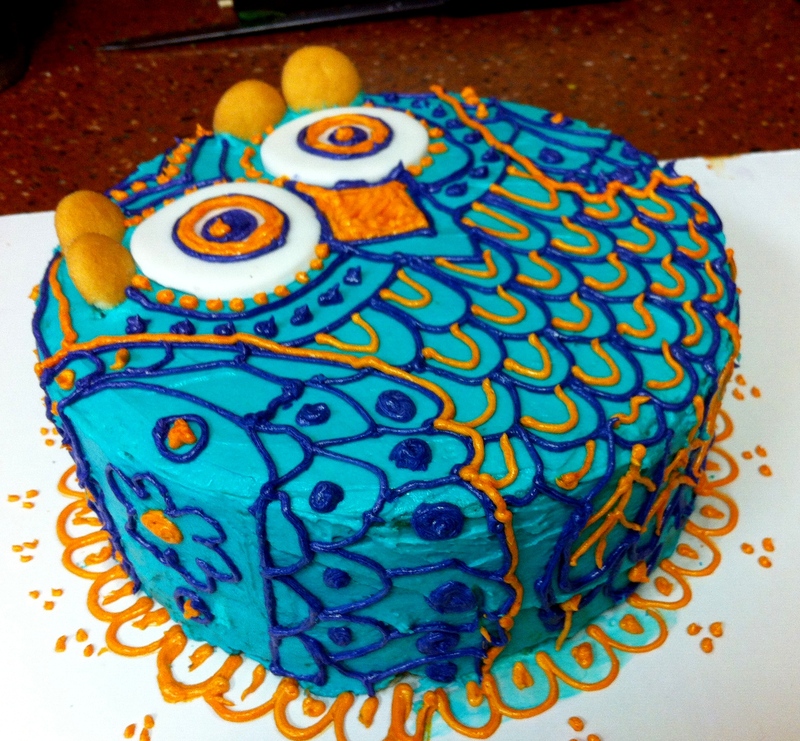 This is an owl cake I made for our daughter’s 3rd birthday. Okay, I’m not suggesting you make someone a full-on CAKE, but if baking is your thing, I’m sure you already have ALL sorts of wonderful, edible ideas. We made cookies for the local firefighters, and they were so happy to have us stop by, that they didn’t even notice (or care) that I pretty much stink at making decent cookies. 10. Fill Up A Cup. This is an easy go-to I like to do for teachers or friends. Find a cute cup (OH! Look! This one happens to be from the shop of our collaboration doodles! Um. Yeah, a lot of people might be seeing those for Christmas this year…). 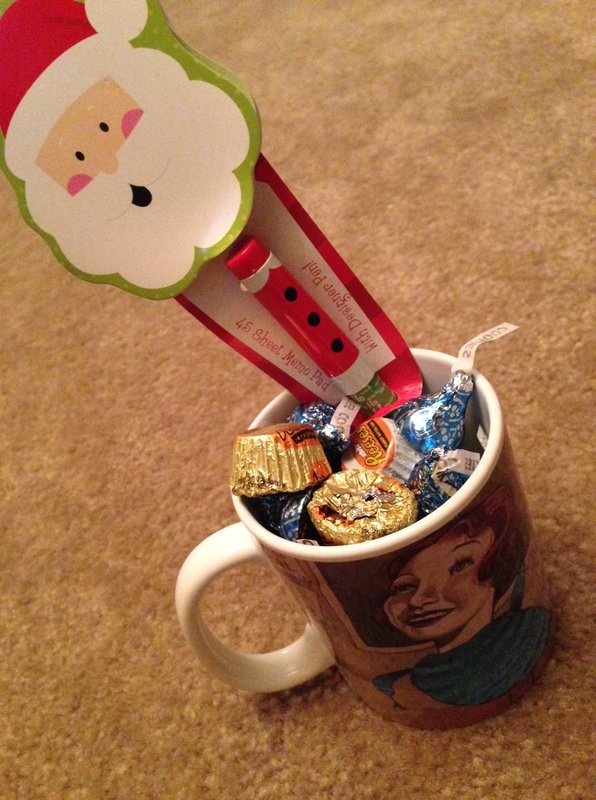 Anyway, fill up the cup with a handful of chocolate kisses or candies, a pen and a notepad, and show your teacher how much you appreciate them! Okay, we’ve been sick. We’ve been feeling all around miserable around here this past week. So I’ve been slacking in the blogging department. Hey, I can’t keep it ALL together ALL the time. I’d run out of duct tape. So I thought I’d share this quick little project as a sort of mini half-post. I promise I’ll write a better one in a few days. Well, darned if I don’t like a challenge. So I did. It took me AGES to figure out if that was even possible. 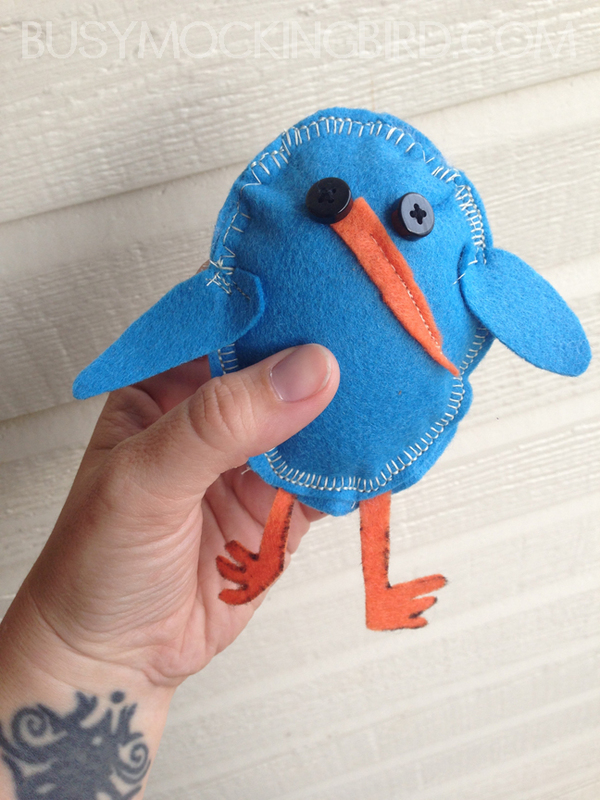 I thought about hand-sewing felt, about stitching the detail on with embroidery thread. I thought of all kinds of magically impossible ways this could possibly work, and was coming up blank every time. Until finally, I lowered my standards. 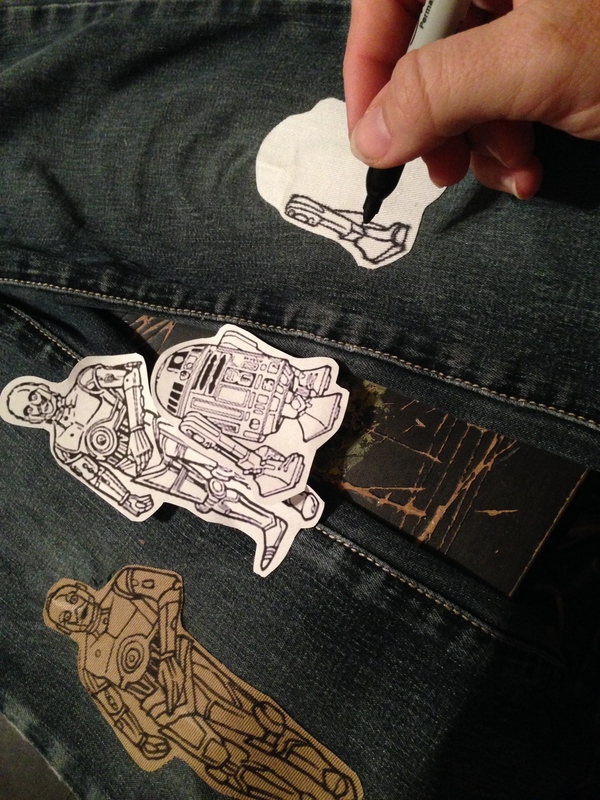 I finally just cut a simple outline of the body out based on the references I printed out (in black & white in the center), filled the detail in with Sharpie, and ironed them on. Bam, easy peasy. 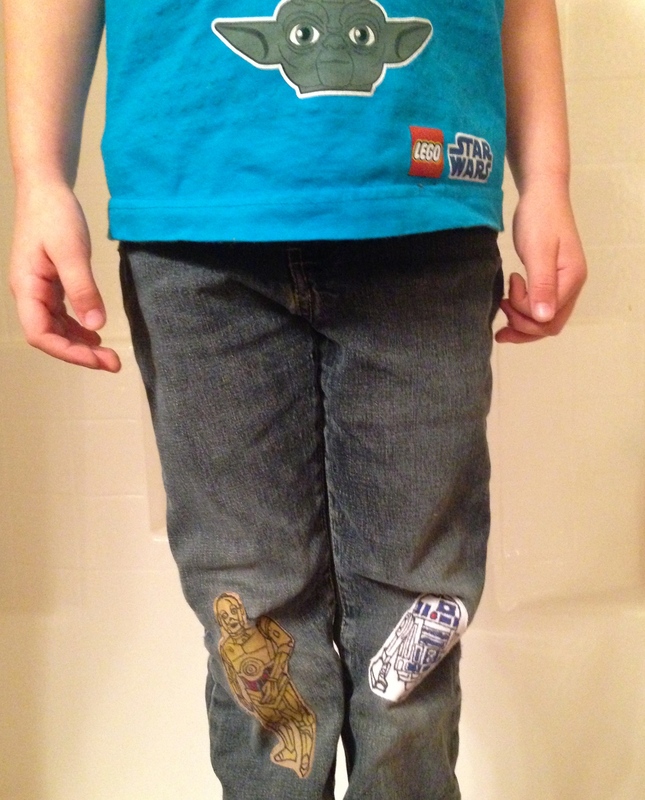 She liked them so much, she insisted she wear her Lego Star Wars shirt to match. Anyway, we’re all on the mend here. Hope you’re all feeling well! It’s SO amazing to see all the beautiful entries coming in from all over the WORLD for the contest…and even more amazing hearing all the wonderful stories of the fun you all had creating them! Don’t forget, Monday is the last day to enter, so let’s see what you’ve got! 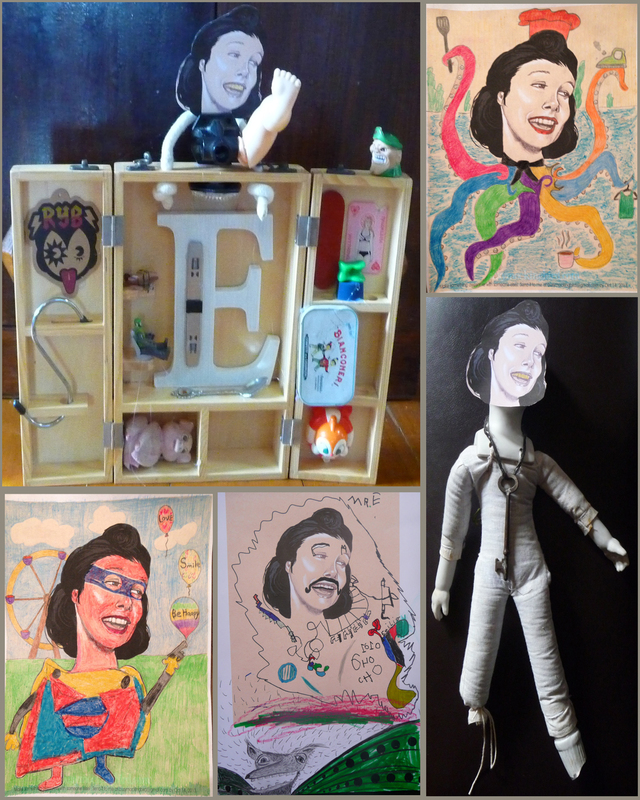 Contest entries are coming in from all over, and they’re so awesome! Have you entered yet? …Looks like you all are having a lot of fun with it, and I want to see MORE! One more week to enter! If you want to give it a shot, head on over to the last blog post and try it yourself. Good luck and most importantly: have a great time with it! Sometimes, inspiration is found in strange places. There are some children’s books that are so dull and obnoxious that every word irritates you as you read it to your wide-eyed kid. These are usually the same books that your kid is madly in LOVE with, and therefore insists you read them over and over and over again until the grumble inside your head starts to show on the outside of your face. But there are good ones, too. Sweet ones with beautiful drawings and lovely stories and poetry, charming and funny and endearing. And then there’s Calef Brown. He’s a different sorta bird. We discovered “Polkabats and Octopus Slacks” quite by coincidence, but the fact that the poems are so strange and lovely, combined with the use of the words “polka turds” cracked the Kid up, and we were hooked. I had never seen a kid’s book like that before. I’ve read them all tons of times, and I have yet to be bored by them. He’s a whole lot of funky, a little bit full of one of those giggles you cover with your hand, but all kinds of fun. You know what? I would, too, kid. That sounds like fun. So I decided to sew one. Challenge accepted. I wanted the wire to go all the way across to span the top two wings for strength and the bottom two wings the same. 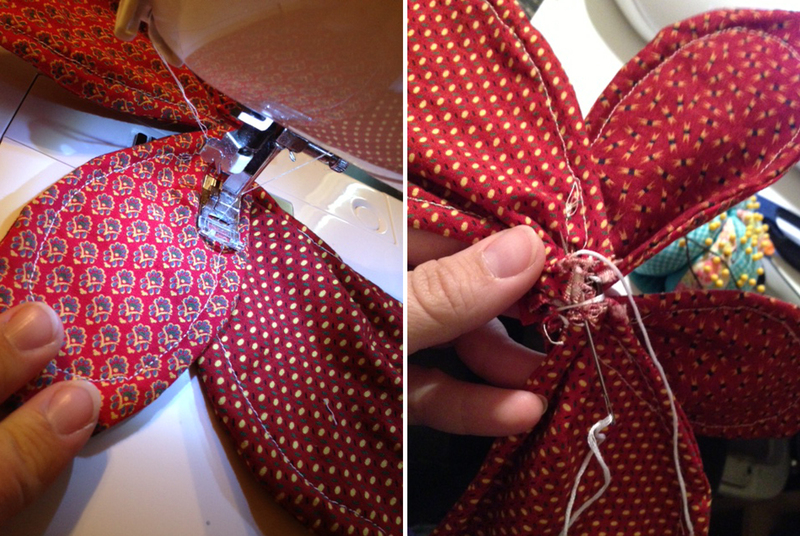 I pushed the wire into the open wings, and held the wire in place with machine stitches. 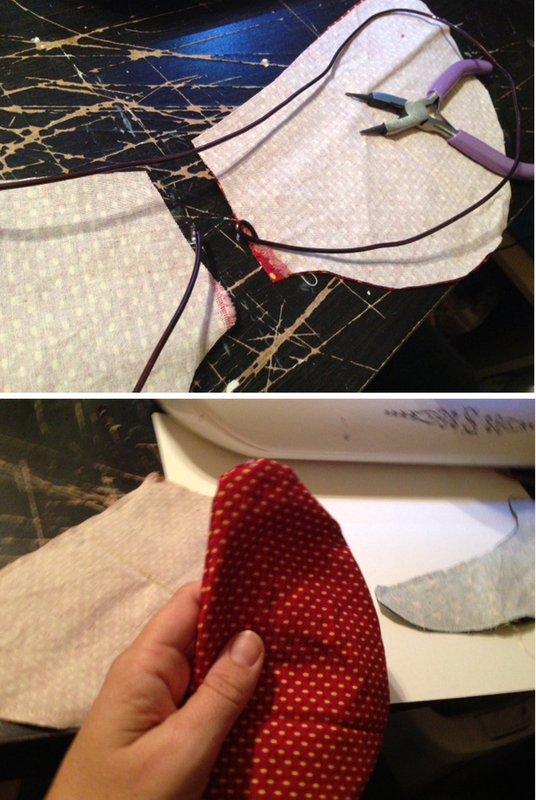 I also stitched the top set of wings to the bottom set, so they’d sort of stay in place. 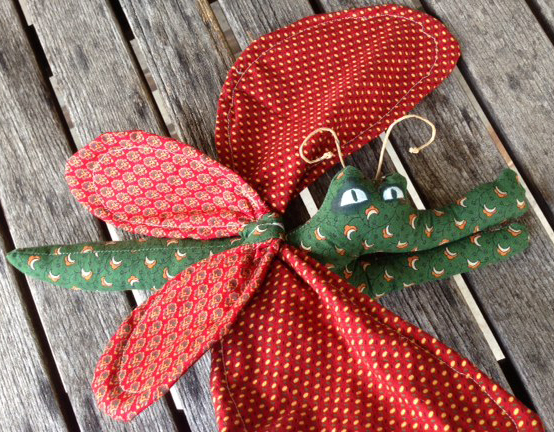 Now I had a pretty cool pair of wings…with no way to attach them together. I decided to at least get some embroidery floss and sew the open ends to each other to sort of hold the wire in place and keep the wings from just sliding off. This is where all hell broke loose. So now I’ve got all these exposed seams on the wings. How the heck do I get it on the body? I can’t sew through wire. So I made a little green “belt,” wrapped it around the open seams (which covered them fairly well) and then stitched that onto the back of the gator’s body. Pretty sloppy, and if you look at it closely, the wires will pop out. Good thing I bent the edges so they don’t totally cut you like a brassiere underwire. 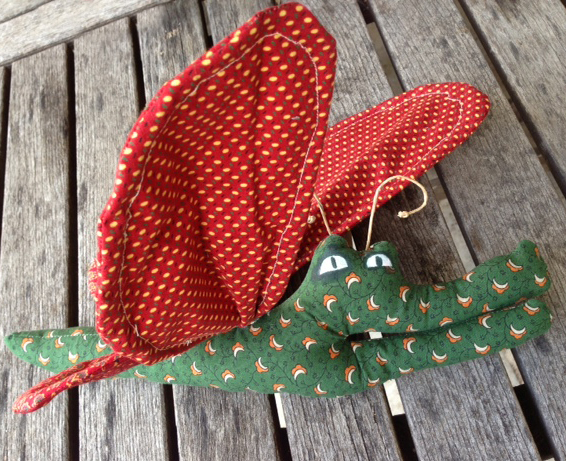 So with the wings shoddily attached to the gator skin from both the outside and the in, the time for stuffing had come. After what seemed like 18 hours of hand-sewing the bottom of the gator’s body (a good tutorial for hidden stitches here, by the way), it was time to paint the eyes. I got out my acrylic paint, and risking my daughter’s critique for putting both eyes on the same side of the head (it’s like that in the illustration!! ), I painted them on. I wanted to add some antennae as a final little touch, and found some bendable wire floral rope that I had lying around that I can’t for the life of me remember why I own. Do I have any clue how to attach it to the head? No. In hindsight, I probably could’ve just used embroidery floss to tack it to the back (Yep, I probably should’ve done that). Instead, I cut a couple of tiny snips in the back, threaded the wire through, and glued a fabric panel down with fabric glue. This did actually keep the antennae standing upright, but I suppose a few good stitches could’ve accomplished the same effect without making this fella look even MORE strange. And so here is the final result in probably the weirdest little doll I’ve ever made. The thing is, though, I think he sort of matches the style of the one in the book, which is sort of what I was going for. 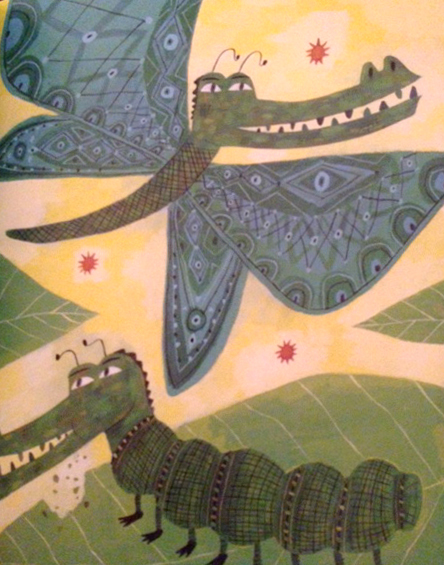 I mean, an allibutter gatorfly’s not SUPPOSED to be “cute”…right? Well, it’s okay if he’s a little creepy. 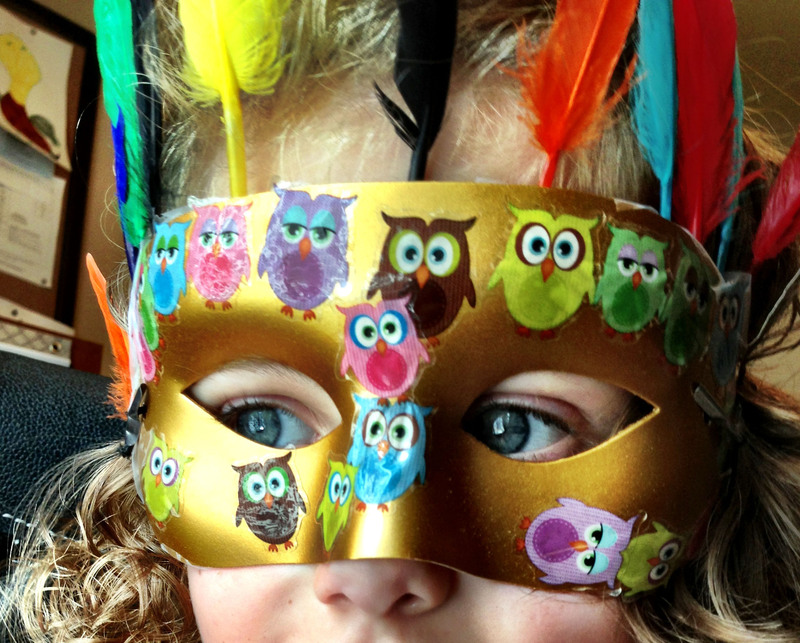 When I picked my daughter up from school and presented her with it, she sighed with delight. “He’s so BEEEAAAUUUUTIFUL!” she said. And that’s all that really matters. 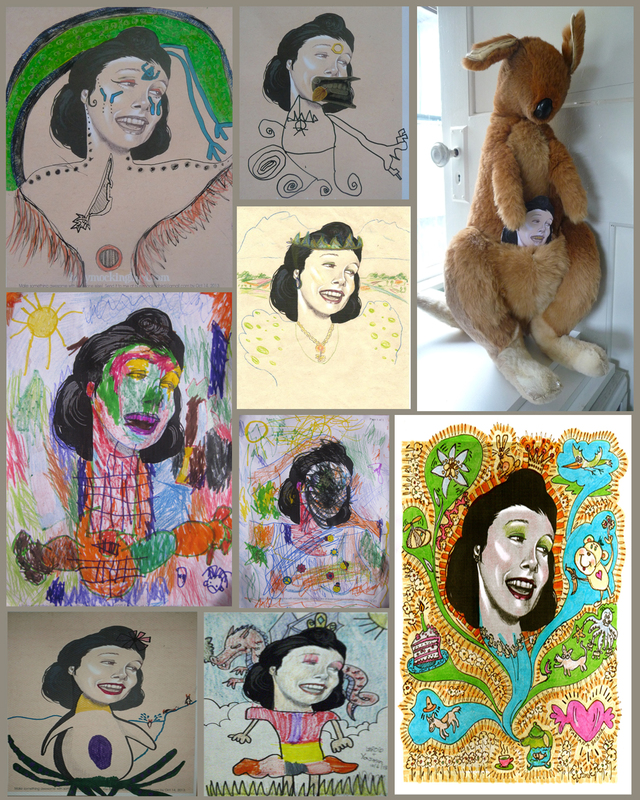 So have you been inspired by weird art to make something in tribute? I’ve found being an artist a very solitary lifestyle…it’s something I often do by myself. 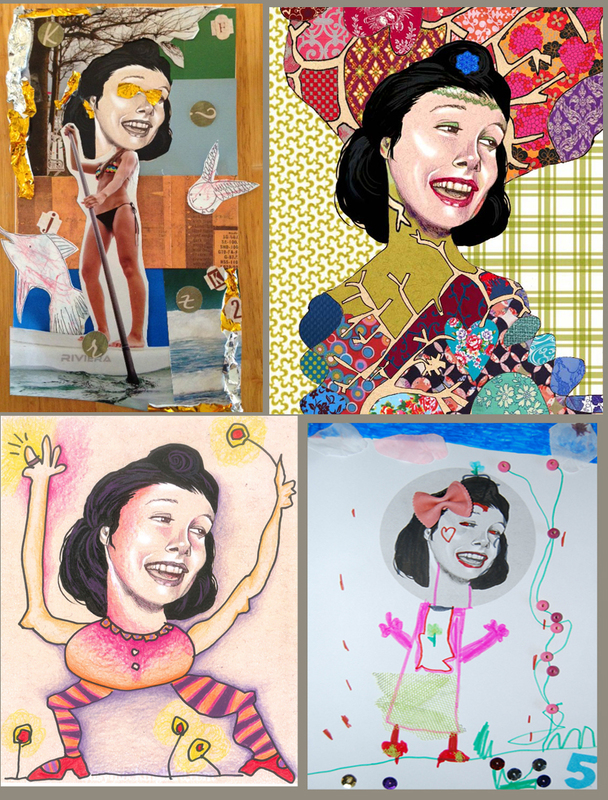 I could spend hours and hours at a time on my own, just painting and drawing, sewing, sculpting…creating. Often, I wouldn’t start a project unless I could devote three to five hours on it. 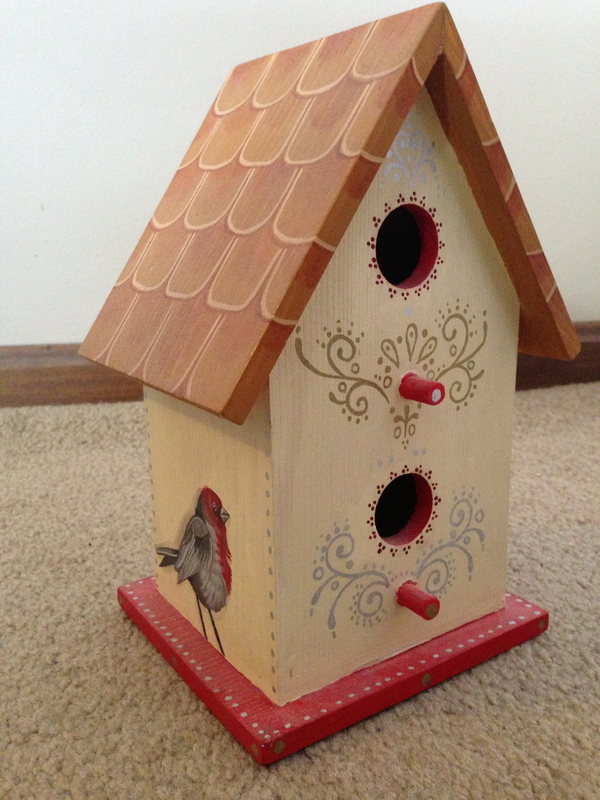 After I had my daughter, I found it difficult to find the time to carve out to create. I couldn’t have the hours and hours on end to myself–there was another little person there, asking, needing, wanting, and I enjoyed her very much. I still felt the tug to create, I just had to learn to enjoy it in smaller increments. To be able to put it down at a moment’s notice, and pick it up again quickly, when I got a chance. People ask me all the time, “how do you find the TIME to do all these projects? ?” And the answer is that I didn’t much, for the first couple of years. I waited until bedtime. But now that our daughter is four, the answer to that question is: DISTRACTIONS. She’s developed a love of art and crafty things. When we’re out of something (anything), she’s been known to say “well, let’s just make our own.” I’ve taught her that there are no mistakes you can’t fix. I’ve taught her about “happy accidents” (an artistic lesson my mother instilled in me when I was young, and Bob Ross reasserted). Now that’s she’s a little older and enjoys crafts and drawing and creating, I’ve learned that I CAN create with her around. I’ve learned a little bit about how to SHARE my time, which has always been difficult for me, especially concerning artistic endeavors… And I’ve learned that if I let her go wild doing something similar to what I’m doing, she not only enjoys herself, but she learns from me. 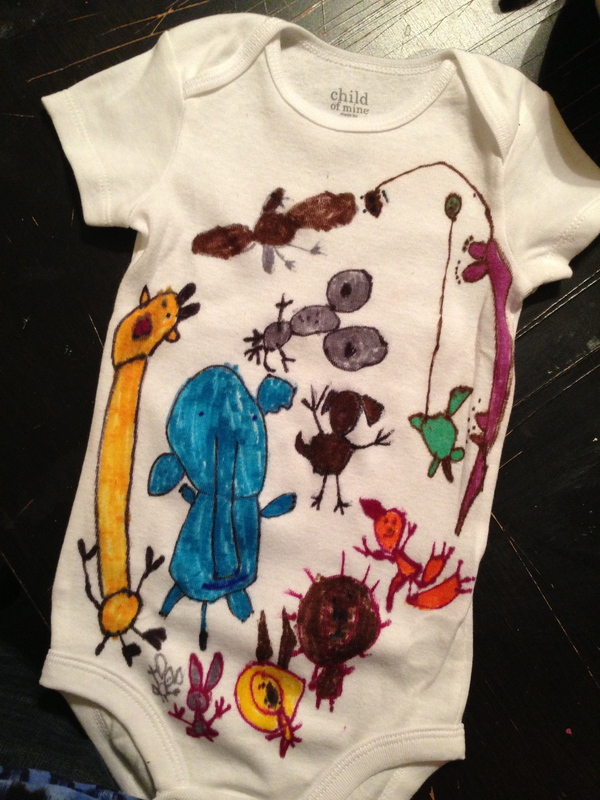 If I’m painting on fabric, I let her paint on fabric. I don’t mind a mess (but I also don’t put her in her best clothes when we paint). Sometimes I let her use the “good stuff” (like acrylics and permanent markers), and teach her how to use them correctly. I remember being a kid and the feeling of using new paints, or having a marker that was dried out, or the difference between drawing on newsprint versus fine sketchbook paper. If she’s into it, I want her to experience all that, too. We also subscribe to something called Kiwi Crate, which sends out a box every month full of 2 or 3 super easy, super fun kid projects. She’s always so excited to get them in the mail and get started on the projects. And best part? They require very little parental assistance! 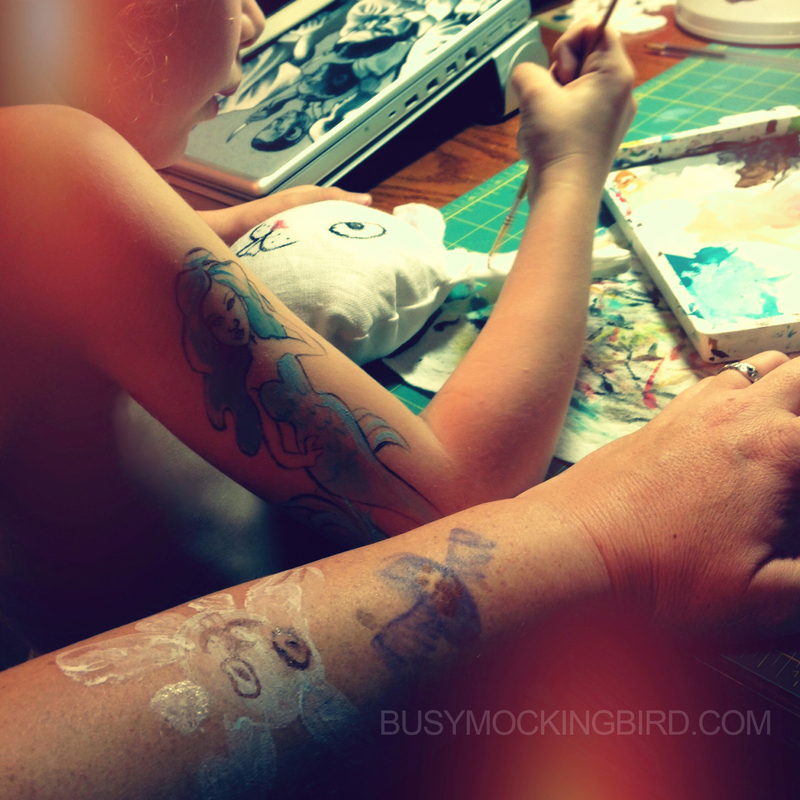 …So this is how I do all the creative projects I do, now that we have a kid. I’m very grateful that she is so artistic, and I’m enjoying that for as long as it lasts. I know as a parent, things constantly change, at just the moment you think you’ve got things under control, but for now I am enjoying sharing my creative time.